My concept of global powerlifting meets run over the Internet. Everything, from graphic design and programming to branding and marketing, is my work. 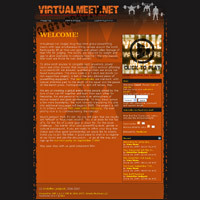 I am currently programming software to automate most tasks related to running the meets. For two years, I was the technical developer of a Tibetan-Chinese-English digital repository in cooperation with Northwest Minority Institute of Lanzhou, China. Designed to hold vast collections of research and multimedia related to the Gesar Epic, I coded the design, backend and various utilities (including a Tibetan parser in Ruby). I heavily modified EPrints and learned huge amounts about Perl, Unicode and server-side image manipulation. Unfortunately, the project ran into financial trouble. Guru serves up delicious Indian food in Madrid, Spain. Working from their Spanish-English menu and a few photos, I created a bilingual site driven by two separate language files for easy updating. The color profile is mainly derived from the client's menu, the font in the logo was not known and I had to track it down. The home of my personal whims since 2003. The site is continuously growing and defies neat categorizations, but among the possible highlights are my Tibetan software projects, my powerlifting blog and online scripts, and naturally(!) the annual gingerbread project. The site is driven by my own lightweight templating system. 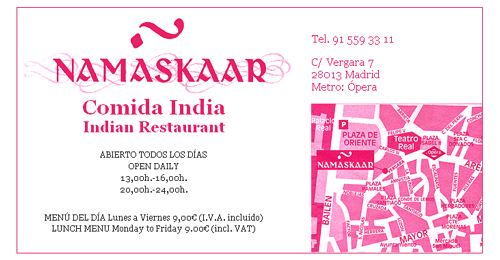 Newly opened, this Indian restaurant in Madrid needed a web presence quickly to catch those customers searching for them online. They were not ready to launch a full site, so I took the details out of a small foldable restaurant menu they gave me to create a "business card" with the details a prospective customer would need to get delicious Indian food on his plate. Beats a placeholder any time of the day. Created in about an hour. Once upon a time, a close friend of mine operated a pizza place in downtown Helsinki. I took a few photos of his tasty work, grabbed a menu and produced this very pizzalike site to make life easier for those ordering by phone. I also took care of the translation to Swedish. Driven by a trilingual ingredient file. My significant other is a marvelous woman. Drawing of all kinds is a significant part of her life. This site translates as The Wondering Lady and contains a select number of her cartoon strips (here's one in English for you). She told me what colors to use, I took care of the rest. The strips have appeared in the magazine Astra Nova. Karl "Kalle" Augustson needs no introduction in Finland. For years, he and his volunteer organization Lazarus Human Aid have selflessly helped the needy both domestically and abroad. I manage his trilingual website as a small tribute to his work and also take care of the resultant translation needs.